Friends, don’t rush on a project. And, always make sure you cut your knits with the stretch going the correct direction. With that fair warning, allow me to begin my tale of woe. A few months ago I was browsing the men’s Valet Magazine’s fall shopping guide and stumbled upon their ‘sweatshirt’ section. 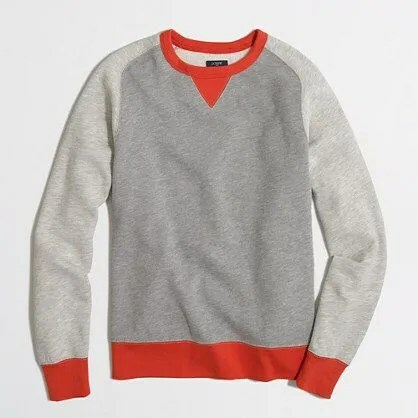 I immediately fell in love with the neutral color blocking of the J.Crew version ($85 retail and $60 on sale. Poly/cotton obvs) and figured I could easily sew one up on my in in wool jersey as a Hanukkah gift for Jordan. 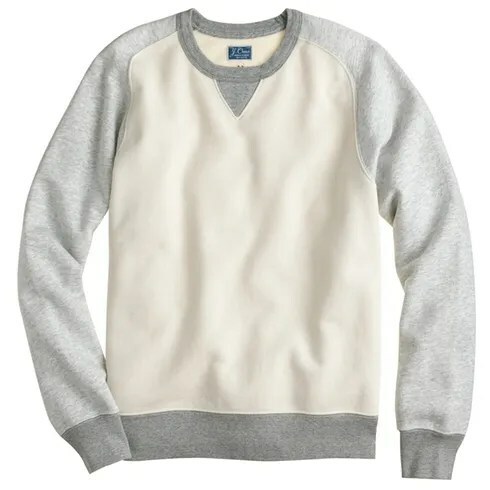 **I’m calling this a baseball sweater because the ones with raglan sleeves and wool are called that on the J. Crew website. 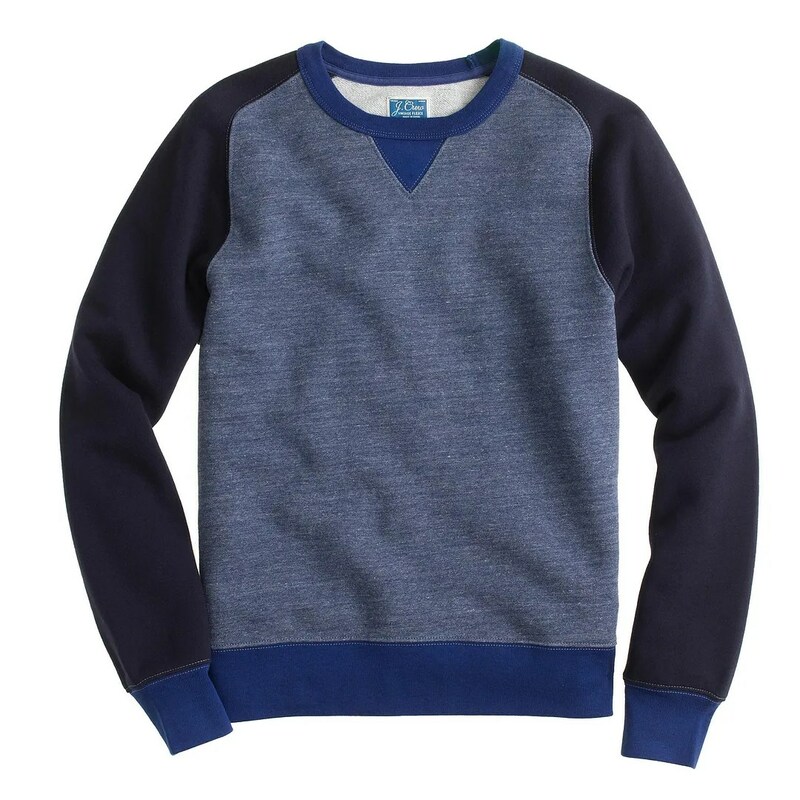 The ones in wool with set in sleeves are called baseball sweatshirts. All I needed was a pattern for a raglan sleeve sweatshirt. 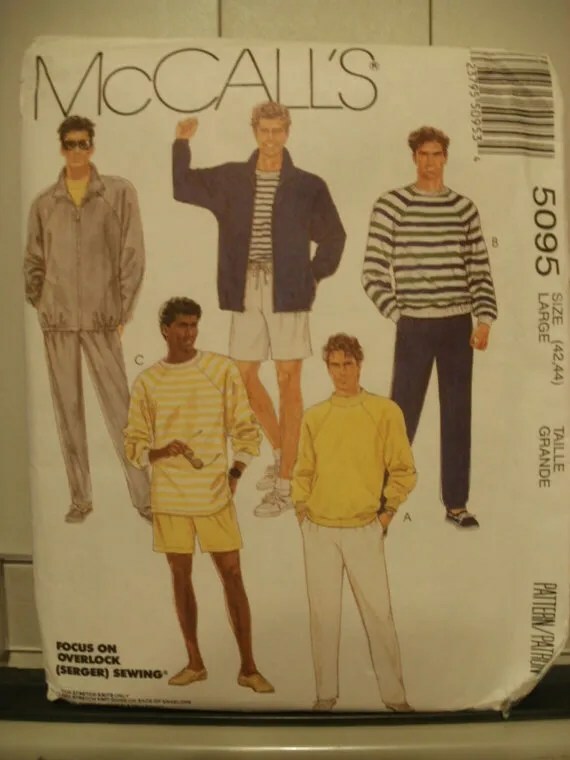 I found this McCall’s dating back to 1992. Jordan measures a 43 in his chest so I purchased the Large for size 42 – 44. Naturally, it had 14 inches of ease at 58 inches. That, is a no go. I then bought a medium (5 inches of ease with 47 inches finished garment measurement) and sewed that up instead. I first muslined this in a really nice charcoal ponte I had in my stash. Gah. It was SO HARD to let that fabric go for him. Based on the muslin, I decided to take in the waist 1.5 inches on each side, shorten the sweater by two inches and widen the waistband 1/2 inch. I really liked the fit through the chest and the sleeve length was perfect. 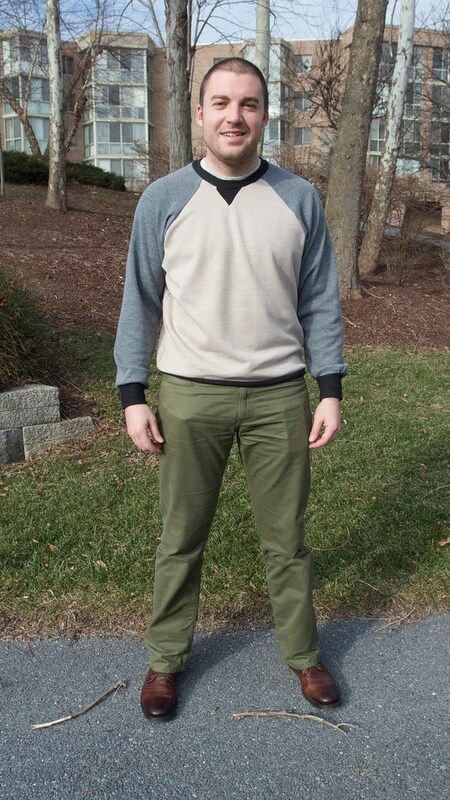 For the ‘real’ one, I used three wool jerseys for the color blocking. Jordan also thinks he has a short torso and asked to have another three inches taken offof the length. Fearing an 80s style crop top, I ignored my client and only shortened it two inches. Below are some of the ones J. Crew has in 100 percent cotton. I did not do all the same topstitching as them. I wasn’t going for a sporty look. More like, weekend movies. Folks. Here’s where it all goes awry: What’s that you see to the left of the triangle? I don’t even know. The neckband was cut (accidentally) without stretch. So, I was trying really hard to serge the neckband on. Yes. *serge* as in sewing off the seam allowance. Because the neckband had zero stretch, I thought the neckline had stretched out and just needed to be taken in a little bit. 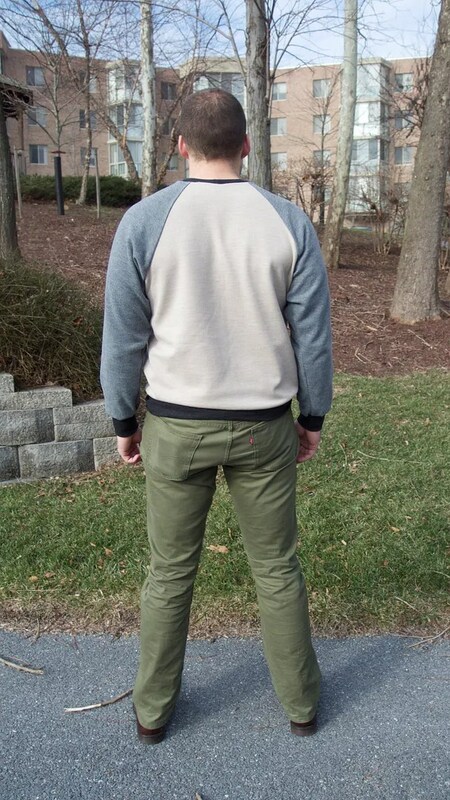 I got the *brilliant* idea of taking in the shoulder seam seam between the grey and the cream on ONE SIDE. One thing let to another and next thing I knew I had to add beige fabric *back* to the top and one side of the shirt is an inch wider than the other. FML. And, I acknowledge the point in the triangle also got destroyed in this process. I contemplated scrapping the project and starting over. I thought about unpicking seams and recutting the front. But, I didn’t. Why? I really really hate to fix. Also, it was all serged and I didn’t want to overwork the fabric. And, wool jersey is real expensive. I figured at worst, he could wear it around the house. It’s still warm. And, it does fit. Plus, I actually have enough that I can just start over again for next time. Initially, I was thrilled when I made this (before the neckband). And, in truth, I do have a pattern that I can use for sweaters and sweatshirts. I can see making this up for a long time. And, best of all, IT’S SO FAST. Seriously. I can sew this in under two hours. 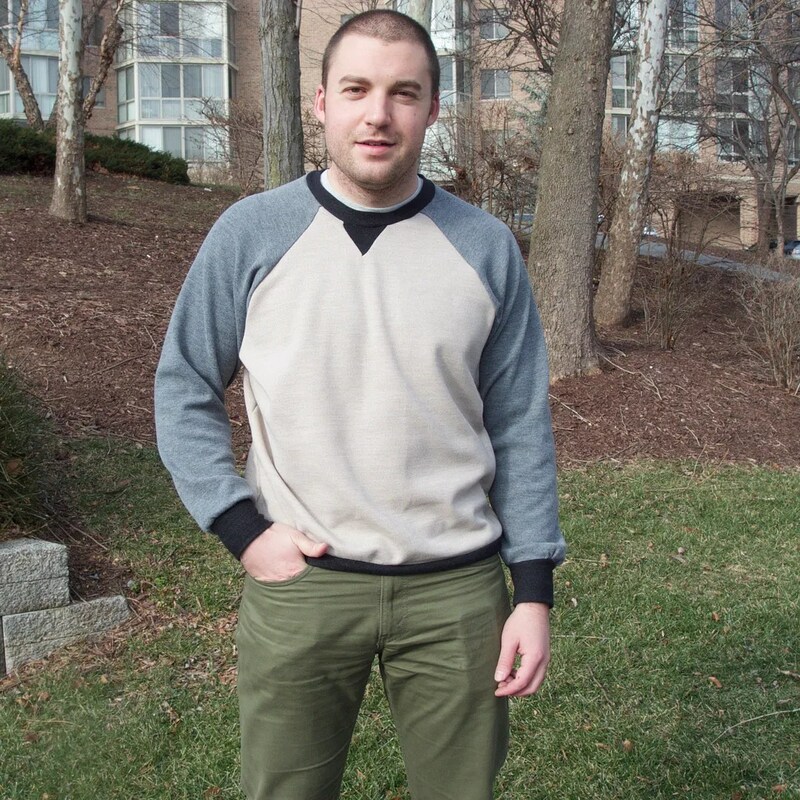 Jordan, god love him, still wore the sweater out with friends and says it looks just fine to him. 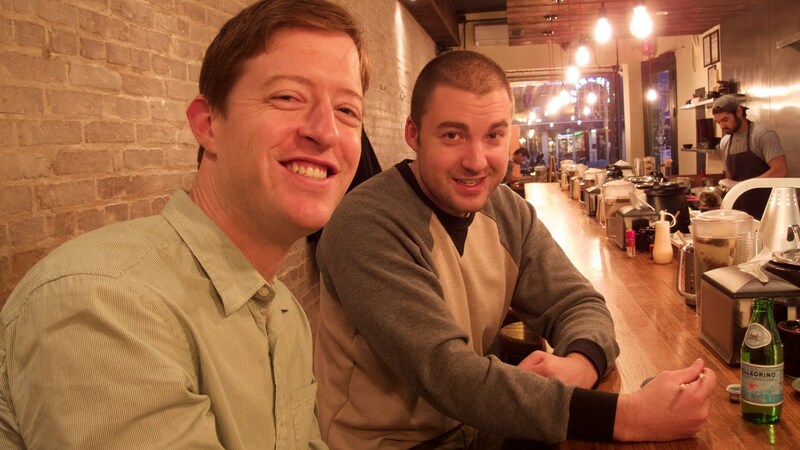 He also hates having his photos taken in public places…. Next up… I have one more thing I’ve sewn for Jordan this holiday season. If I can talk him into modeling one last time. Such a great sport. Wearing it anyway with the wonky triangle. I was sewing a Pendleton wool pillow today with the back side done in strips of various wools – a very simple project. I have sewn these many times. Even though I have sewn a 24″ pillow before and even though I scored a 24″ pillow form on huge sale during cyber weekend, I could not figure out why the backing piece was so huge. So I trimmed it down to 18″ square. I installed the zipper and about four strips before I ‘woke up’. Duh. 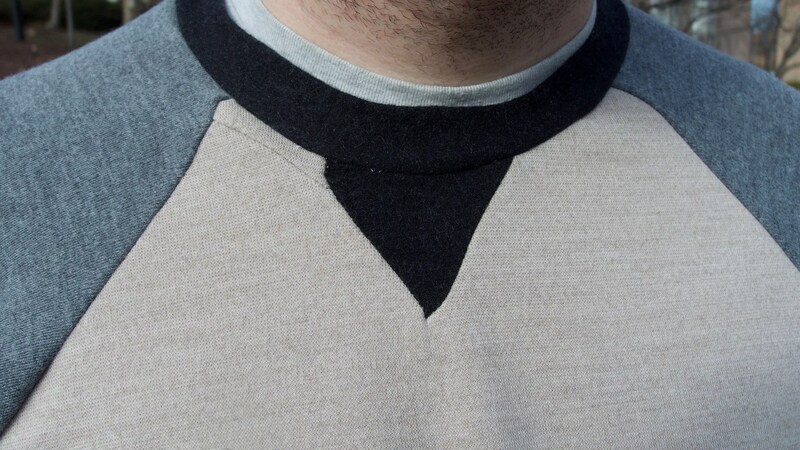 This was much easier to fix than your baseball sweater – I just added a vertical strip to one side. hey we’ve all had days/makes like that. Why not make a slightly bigger triangle and attach it –like a patch– over the wonky one but on center? Problem solved! 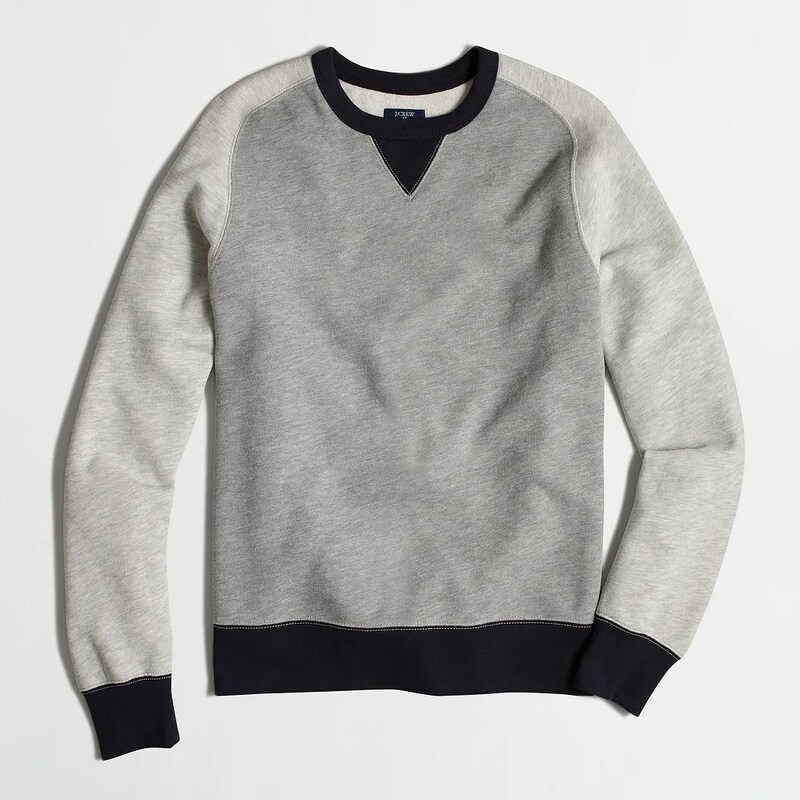 It still looks great on your husband – they don’t fret about small errors like we do. Write this one down to experience and enjoy knowing you have a great pattern for future use. Guys don’t even notice stuff like that, there are more important things like the game and more sports. Consider this a muslin…an expensive muslin but you don’t have to make that mistake again…it always makes for a more interesting blog post than if it had turned out perfect the first time. Once the snow falls he will be wearing a scarf over it and a jacket…no one will know and it was made with love so that is the only thing that counts! Actually, years ago, I made a sweater like that for my son and for my husband and had the same triangle issue both times. Maybe this is just a design flaw. I figured that if I ever did it again, I’d just make it an applique. How about appliquéing a patch to cover the oops and calling it a design element? I actually am wondering if I center and applique a larger triangle, if that might make it more balanced visually. It fits him soo nicely! That fabric and color was just too nice to not wear. No one is ever noticing that little mistakes on the front, seriously. I forgot to ask about those “other things” you were working on in your sewing room for him… I’ve been meaning to make some of those and have no idea where to start or if they are super complicated or what. Your little goof isn’t noticeable unless you point it out. My New Years resolution is that I have to finish all my half-baked projects lying around before I am allowed to start anything else! Well at least you didn’t make it with the 14 inches of ease! And I agree with everyone else that men are so oblivious to these things so at least it won’t go unworn. 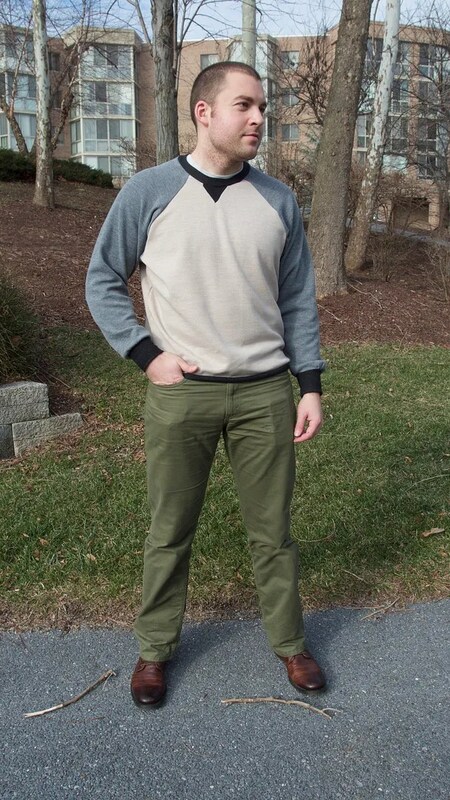 The fit looks great, so I hope to see it made up again! I’m really glad to see your mistake, because so many blog articles just have the successes! I suffer from fear-of-failing in the sewing room, and so many things don’t get sewn up for because of that. I actually can sew quite well, but still that fear that it won’t be PERFECT is deeply engrained. Hey, just wanted to say, great screen name! Your stuff always looks so wonderful – I admit, I laughed to the point of tears at your whole “What’s that to the left of the triangle, I don’t even know.” LMAO. That is a little too close to home for many of my projects. Thanks for sharing. It gives me hope! Also your husband is the bomb. Love it. Happy Hanukkah and thumbs to Mr Mellow for good-naturedly taking to this, and wearing it outside the house! I didn’t see if on the full-length photos at all. Plus there are always scarves to knot nattily around the neck. I just screwed up two faux wrap maternity tops by finishing the edges with CE serged on not flat but with the diff feed activated. It looked good–but flipping it over and coverstitching it’s ripple city all around the neck. Pressing would melt the CE and make plastic melt spots. Am going to finish them and wear with scarves. I like it! I need to sew for the men in my life. I too hate redoing so I would have also let it go and guys aren’t nearly as uptight about things as we are! Great gift! Love the tell-all in the making of this garment. If you need to get that close to see those alterations, you are too close! Second, I think it fits Jordan fantastically, so you did a great job on this. Finally, now that you’ve managed to make such a great version you’ll be able to turn out more so easily. I’m really impressed with you making these for Jordan! This looks great! I couldn’t see the issue at all until you pointed it out. It’s really not at all noticeable! I love this style and the color palette… what a thoughtful gift! That looks so good. Very close to the original!